Baba is You, developed by Hempuli Oy, is a sokoban-pushing puzzle game with a twist of rules manipulation. In this 2D game, the internal rules are presented as pushable blocks and your main goal is to push these blocks around and then combine these words to form new rules to solve puzzles. Unlike other puzzle games that require you to follow rules to complete levels, Baba is You encourages you to break rules and also gives you enough freedom to create new rules to solve these puzzles. I know, the idea sounds really interesting and smart! The game doesn’t have too many instructions and it only has characters and corresponding objects on each stage. Players may be confused about how to play the game at first, but once you get deeper into the game and learn the game in practice yourself, you will find the game has a lot of charm. We can see the little bunny Baba, three rocks, a yellow flag and four rules in the first stage. Since [BABA] IS [YOU], so players can control the little bunny to [PUSH] the [ROCK], and then touch the [FLAG] to [WIN] the game. However, it can be boring if you follow all the specific rules when you play the game Baba is You. Or you can think creatively and change the rules to make this game more fun. There is not only one way to win the game. You can control Baba to push “Stop” out of the sentence, so the wall can’t stop you and you can walk through to touch the flag. Or you can push the “Win” around the stage and replace “Push” with it, so the rule becomes [ROCK] IS [WIN], you can just control Baba to touch the rock to win the game. 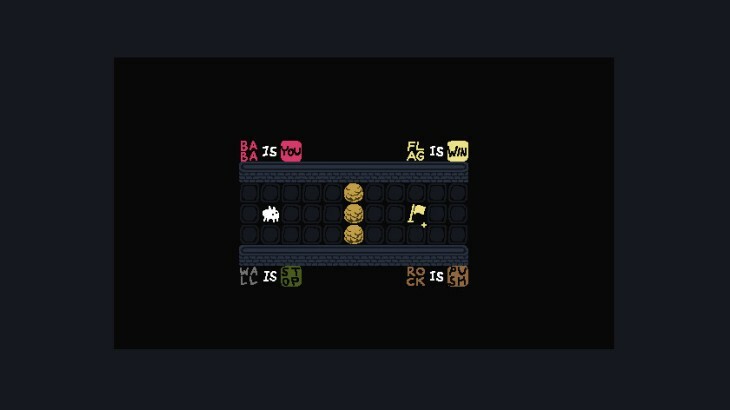 Although the game is called “Baba is You” and the goal is usually “Flag is Win” in most levels of the game, and players also need to control the little creature in the first few stages. But if you want to complete these levels successfully, you need to change the rules and characters by moving and replacing the words. Sometimes “Wall is You”, so you can move all the walls every time you move; Sometimes “River is Push”, so you can push the river without sinking in it. And your goal in the game is not only touching the flag in the game. Actually, you can become a flag by changing the order of the words or touch Baba itself to win the game. Of course, not every combination of words will work well in the game. You must think creatively but also don’t think too far outside the box. Some sentence like “Stop is Win” is nonsense in the game and it won’t help you win the game. And it must be something is You, or you will end the game. You can break rules doesn’t mean there are no rules in the game. The reason why Baba is You become a game changer from regular puzzle games is not just because a creative idea, the most important thing is the developer has considered almost all the possibilities of the gameplay of each level. From the simple X is Y statements to the logical phrase, and then the complex modifiers, each new element is not independent but is combined with other elements to make more possibility of the game. The puzzles are presented as separate levels on a world map. I think the shortcoming of the game is that the current difficulty level of the game is a bit high. Sometimes we may get stuck at some levels, just stare at the screen and have no idea how to solve the puzzle. The sound of the game is great, but if you have to hear the sound, again and again, it can be a little boring. Overall, BABA IS YOU is a great puzzle game that you can play in your free time.